The IBM WebSphere Portal V4.1 Handbook is available in three volumes of Redbooks. This is volume 2. These IBM Redbooks position the IBM WebSphere Portal for Multiplatforms as a solution that provides a single point of interaction with dynamic information, applications, processes and people to help build successful business-to-employee (B2E), business-to-business (B2B), business-to-consumer (B2C) portals. 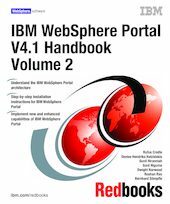 In this IBM Redbooks publication, we discuss the administration and portlet development of WebSphere Portal. In addition, we discuss the use of Web Services.